"Her watercolor spreads are carefully executed with few stylistic mannerisms; all the attention is directed toward the characters. It’s a treat watching Alfie deliver Nia the perfect birthday present." 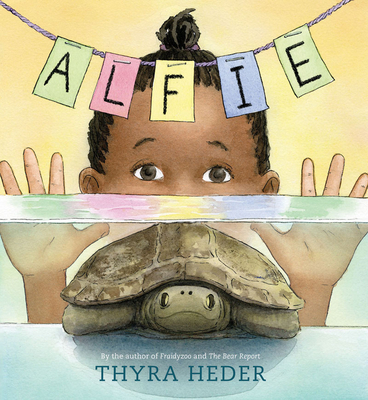 "With beautiful, expressive watercolor illustrations...Heder takes readers on a journey about what it means to be a child with a new pet who sometimes loses its luster but never its worthiness of love. A perfect companion for a young pet lover or pet owner-to-be." "Nia’s and Alfie’s first-person descriptive accounts are extended by lovely, intricately detailed ink-and-watercolor illustrations that artfully highlight the varying perspectives and amusing moments, as when Nia introduces Alfie to her toys...a charming story of the bond between child and pet." "The beautiful ink-and-watercolor illustrations, which feature an African American child (and her family), offer readers lots of clues and thoughtful details . . . A welcome addition to picture book collections."